ENGEO is honored to receive the American Society of Civil Engineers (ASCE) San Francisco Section, 2010 Outstanding Project Award for their work on the Trestle Glen project in Colma (San Mateo County), California. The Annual Section Awards Dinner was held September 23, 2010, in San Francisco at the historic City Club to honor deserving Northern California projects and individuals. Trestle Glen is a mixed-use, mixed-income, transit-oriented, urban reuse development on 1.7 acres that now offers 119 units of affordable housing along with commercial and light industrial options adjacent to the Colma Bay Area Rapid Transit (BART) Station. The project was a public-private partnership between BRIDGE Housing (a non-profit developer) and the County of San Mateo. The ground improvement system that ENGEO employed was used for the first time in Northern California to mitigate liquefaction potential. ENGEO combined recent advances in liquefaction evaluation with pre- and post-ground improvement testing to verify that the project design criteria were met. 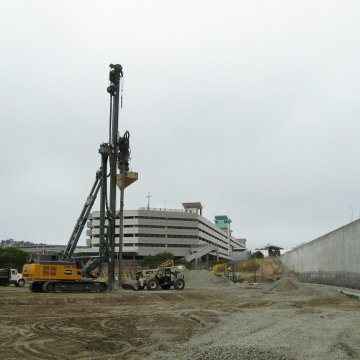 ENGEO also worked closely with the other members of the project design team, including the owner, the general contractor, and the ground improvement contractor to collect the geotechnical data for analysis in a time-efficient manner and to successfully complete the project. The Trestle Glen project also won a CalGEO Outstanding Project Award in March click here to read about it.